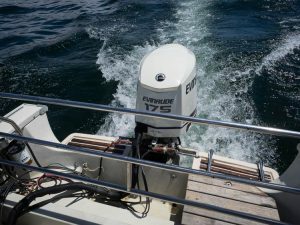 Remember the smoke that billowed off the aging, often failing motor on the transom of the AYC Boston Whaler? 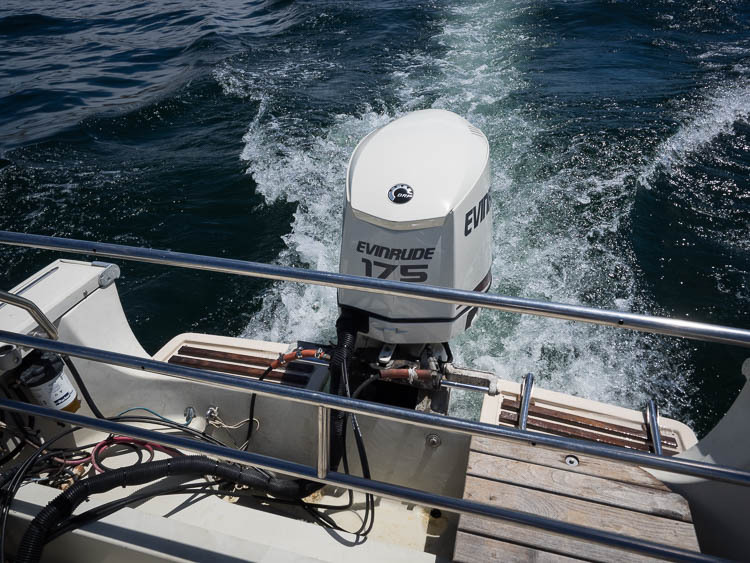 You have a new, 175hp Evinrude E-TEC pushing the old girl now and it’s a beauty. 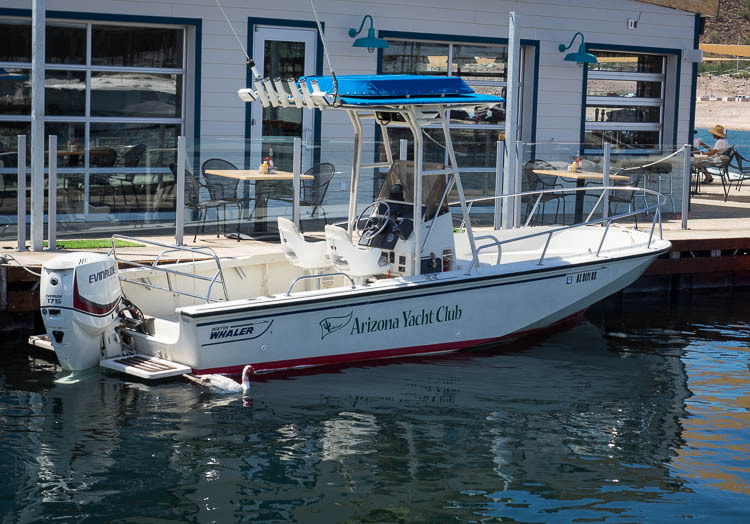 With lots of work by Lake Pleasant Lake Captain David Newland, with the work of Gene Walentiny and the Valley Marine team, the Yamaha is gone and the Evinrude glistens. David and Commodore Mike Ferring took the boat out for a test run Sunday (8/27) and she performed beautifully, standing up on plane with a nice nudge of the throttle. The former lagging steering is now tight and quick. Your club has invested around $22,000 in the upgrade, believing that safety and efficiency on the lake are our most important priorities. The new motor comes with an 8-year warranty. 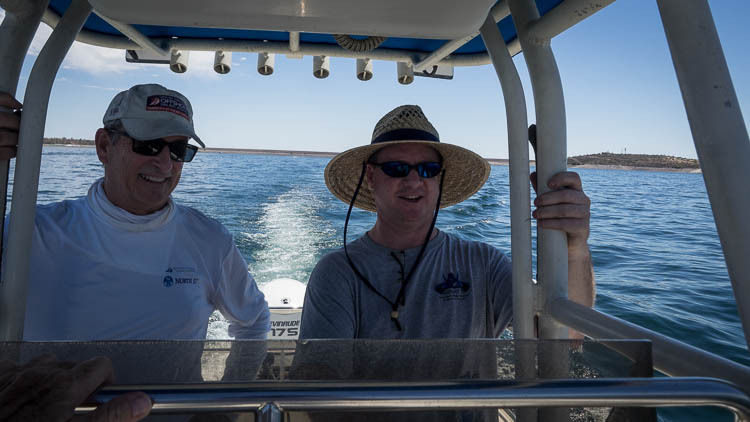 In addition to buying the motor and the attendant controls and gear, David has put in sweat equity—lots of sweat—fixing systems, replacing the rub strip, and generally sprucing up the boat. He found several problems lurking beneath the floorboards, including a few gallons of oil that were supposed to be polluting the air but were in fact gurgling down below from a split connector. David also managed to sell the old motor for $600, which he invested in other fixes. 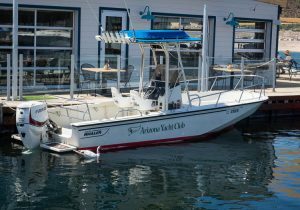 You’ll also recall that the AYC pontoon boat was damaged during the monsoon that clobbered Pleasant Harbor Marina. David has worked through the repairs and the insurance settlement so that the boat and the damaged trailer will be ready in time for the start of the fall racing season.